Does your lounge or TV room invite relaxation? When it’s time to wind down after a busy day, do you like to relax and chill out in your lounge room and watch TV, listen to music, or read a good book? Does your current lounge room offer you a relaxing environment with comfy seating, “sink in” cushions and is it decorated in colours you love? on Designing Inside Out to revamp her space from a boring room into a stylish, yet comfortable room that she and her family now love. 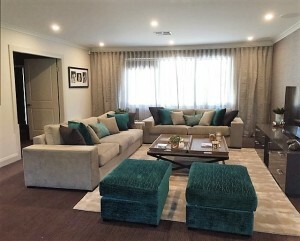 Katie’s brief was for a stylish and relaxing lounge and TV room in their Castle Hill home, where she and her family could relax with comfortable couches, and soothing colours. So we presented Katie with a more family-friendly furniture arrangement, also suggesting style and colours to create Katie’s perfect room. She loved the concept and so we got to work! The existing carpet and wall colour were good, but we added a beautiful metallic grass weave wallpaper to create interest and texture to the TV wall. Sofas were made in a soft, luxurious fabric, ottomans and scatter cushions were coordinated in contrasting accent colours of charcoal,turquoise and silver. 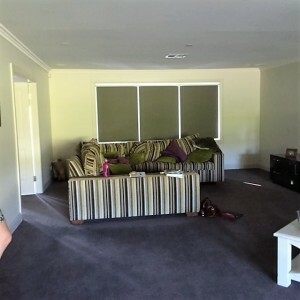 Beautiful, shimmery, sheer curtains were installed wall to wall to soften the wall and the general feel of the room. to coordinate with the black glass and metal console table. Rug, lamps, artwork and accessories were all chosen and placed to add the finishing touches to this now thoroughly inviting room.